Nobody can stake a claim on the art form of Swiss alpine music, which nowadays is both preserved and enhanced. Some yodelers and alphorn players look to their roots and choose to sound as "authentic" as possible. Others have tried to move this music forward: yodelers in traditional costume; rock musicians who have grafted this home-grown sound onto their Anglo-American musical tree; and jazz musicians who have uncovered exciting material in old melodies. This "folk music" has also been a source of inspiration for classical composers such as Schubert, Beethoven and Brahms, just as it has been for contemporary pop musicians and the musical avant-garde. 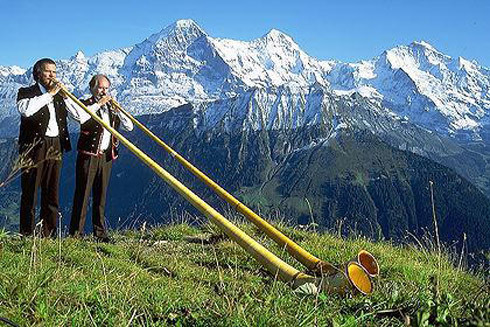 The signal, the call from mountaintop to mountaintop, and communication from alpine pasture to alpine pasture constitute the origins of yodeling and the alphorn. A love for nature and one's region are to this day the core themes of this special mountain music, instantly recognisable from the first notes. Yodeling is a form of singing that involves singing an extended note which rapidly and repeatedly changes in pitch from the vocal chest register (or "chest voice") to the head register (or "head voice"), making a high-low-high-low sound. This vocal technique is found in many cultures throughout the world. In Swiss folk music, it was probably developed in the Swiss Alps as a method of communication between mountain peaks, and it later became a part of the traditional music of the region. 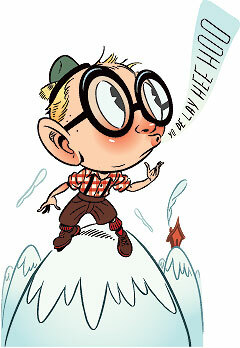 Yodeling can be split up in two main forms: In Alpine regions, natural yodeling without words can be heard. On the other hand, the so called yodel song combines traditional one voice or choir songs with yodel refrains. On special occasions or as an attraction for tourists the polyphonic yodeling is accompanied by bell-shaking or coin-rolling.